NEW Dry & Store Zephyr Hearing Aid Dryer direct from the Hearing Aid Battery Club. Please be careful of cheaper used equipment as it may contain unwanted pathogens.This lightweight and easy to use electrical device helps store and maintain hearing instruments in shape. 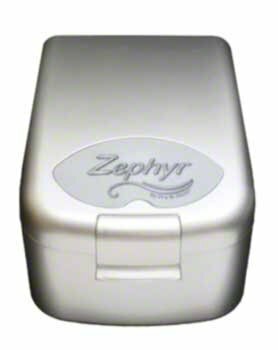 Zephyr removes moisture, dries earwax, and removes odors from hearing instruments. This device circulates warm and dry air around your hearing instuments. Moisture is captured by Dri-Brik desiccants. First desiccant is included with device. Guaranteed or your money back. Electrical appliance that removes moisture from hearing instruments. Helps hearing instruments, including hearing aids, sound better. Removes odor, dries earwax, and capture moisture. Includes first desiccant to capture moisture. Original parts from Dry & Store.